#spartanstar I'm a big fan of protective sports gear and my son and grandsons all work out a lot so I was really pleased when I was given the opportunity to try out Spartan Star Best Wrist Wrap with Thumb Loop. I gave them to my grandson to take to the gym to see what he thought. He said that they were nice and long, 18", and he was able to securely get the fit he needed for the wrist support he needs during weight lifting. The thumb loop makes it quick and easy to get the wrap in place. 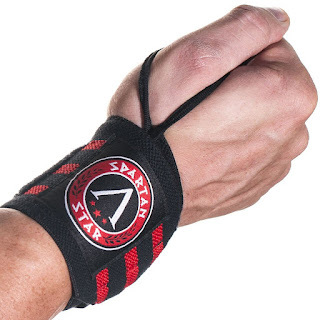 These wrist wraps are comfortable and well made from elastic cotton and the velcro is double zigzag stitched for durablility so they don't let you down under pressure. My grandson said that they fit snug but they don't cut off blood flow while lifting.They are great for weight lifting, Olympic lifting, or crossfit. I'm a firm believer in wrist supports during weight training. Several years ago my son was weight lifting without any wrist supports and he ended up with 4 stress fractures. That ended up with a cast, visits to the orthopedic doctor and 4 weeks of physical therapy after the healing time. That could've all been prevented with the protective wrist wraps he should've been wearing. He's a believer in protection now too, and we've passed that belief on to the grandsons. They have told me these wrist wraps are the best they've tried. That says a lot to me. The company believes in them too. There's a 30 day IRONCLAD LOVE IT or money back guarantee. I rceived this product for free in exchange for an honest unbiased review.